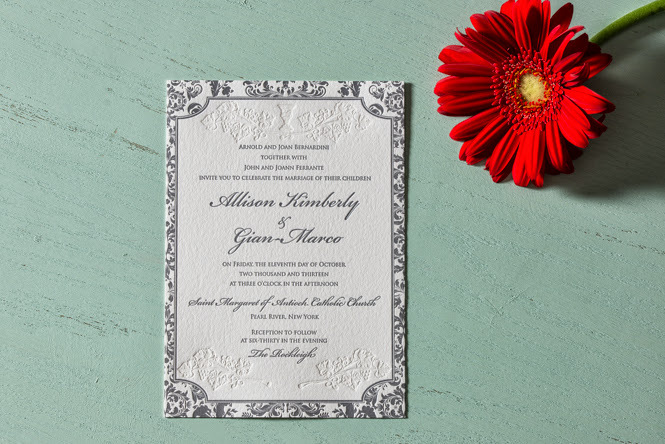 With their wedding quickly approaching (literally in a few days), I really wanted to take the time to showcase Allison and Marco’s letterpress invitations. Allison and Marco are getting married this Friday at the beautiful Saint Margaret of Antioch Catholic Church in Pearl River, New York. The reception follows at the picturesque The Rockleigh in New Jersey. I started working with Allison in early January for their upcoming October 2013 wedding. 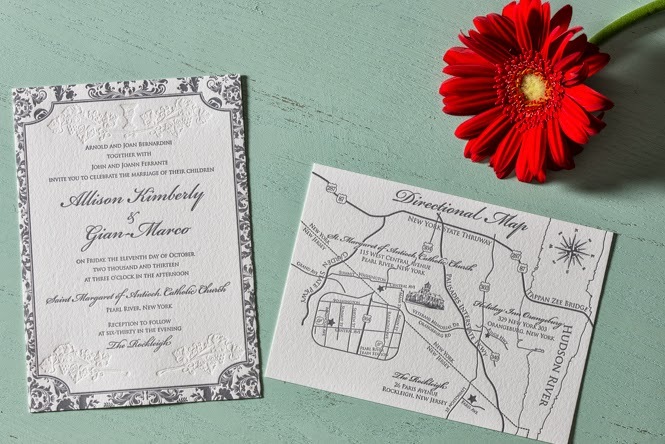 For their wedding invitations, she really wanted to incorporate lace details along with wine vines/grapes. She also sent me a photo of an urn that they’re using for their centerpieces that she wanted to incorporate into the custom letterpress design as well. We decided to go with a 2-color letterpress invitations design, leaving the vines/grapes detail in a blind impression, giving it a subtle look amongst the elaborate border surrounding it. The urn, nestled in between the vines, is also in a blind impression. Because we decided to go with that for those details, I was able to get a deep impression which really showcases the letterpress print so beautifully. She sent me this stunning image of the church that they’re getting married at and wanted include this in the map design. Boy, was I excited to print that one! I just knew the details of that church would print great! For their response cards, we went with a postcard, which I love. 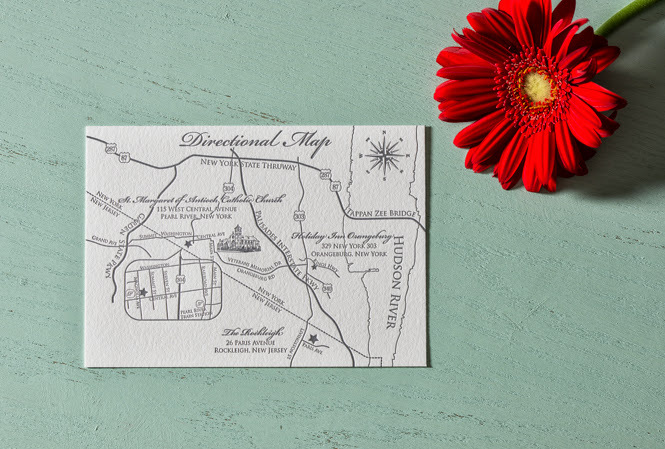 Their entire Letterpress Wedding Invitations were printed on our Pearl White cardstock in 110#. I am honored to have been apart of her wedding process and so thrilled for them that they are tying the knot this week! I absolutely loved the letterpress invitations we printed for them and happy that she loves them as much as we do! You can find more of our Letterpress Invitations Online on our Facebook page here.